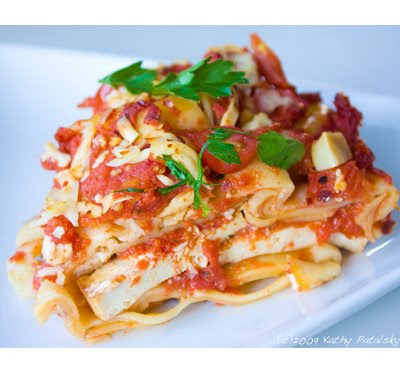 Lasagna Rosso Classico with How-to Slideshow. Vegan. 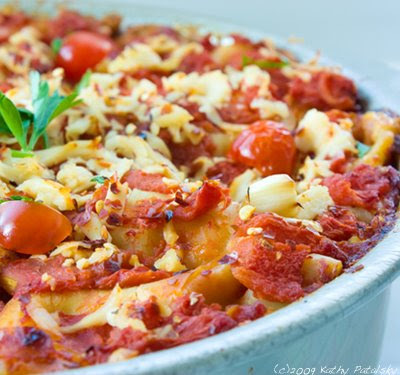 The classic red tomato lasagna gone vegan. That is my recipe for Lasagna Rosso Classico. It's vegan. It's gourmet. 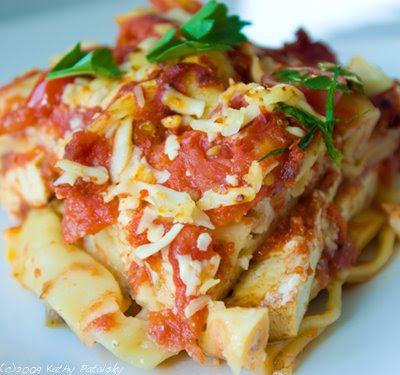 And it's sure to please every lasagna lover-even the non-veg folks. Plus lasagna leftovers are always yummy. Less time in the kitchen, more time eating. Side note: This is part one of the lasagna recipes. In the next few days I'll post my Spicy Lasagna Verde recipe-made with pine nut pesto, tomato-free. Yum. 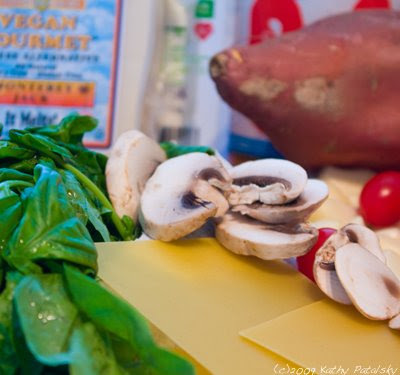 Before you begin, be sure to read my five tips for a better vegan lasagna. olive oil, as required in cooking process. optional layer: a sweet potato layer adds an interesting texture and flavor if you are looking for a creative way to jazz up your lasagna. It also adds some healthy fiber and vitamin A. First lay out all your ingredients. You will be pre-cooking most of the filling ingredients so you want to make sure everything is ready and available on the counter top. Grease the bottom of your pan with olive oil. You may use a 9" round pan or a long rectangle casserole dish. Open the tomatoes and tomato sauce. Spread about 1/4 cup tomato sauce on the bottom of the pan. Then lay one layer of no-boil pasta strips on top of sauce. A little overlap of the pasta is good. 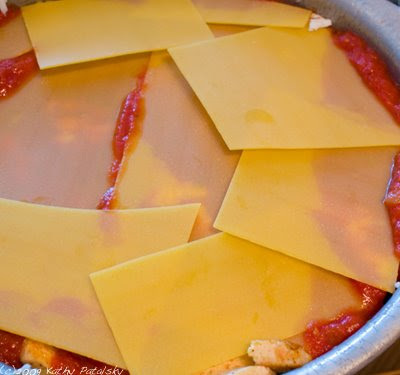 Note: You can actually layer the lasagna ingredients any way you'd like, but this is how I like to do it. Next, put a thin layer of mozzarella cheese on pasta. Set pan aside. 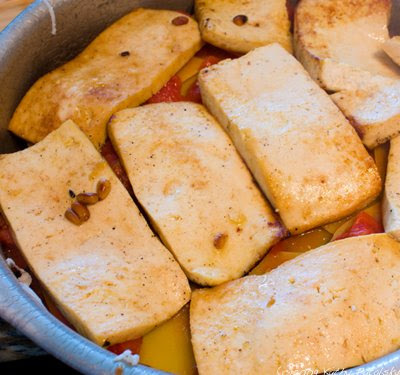 It's time to braise the tofu. First, slice the tofu into 1/2 inch thick strips. Add 2 Tbsp olive oil, 3 Tbsp lemon juice and 1 Tbsp agave syrup to a hot saute or soup pan. Add the sliced tofu. Cover pan and allow to braise for a few minutes over med-high heat. 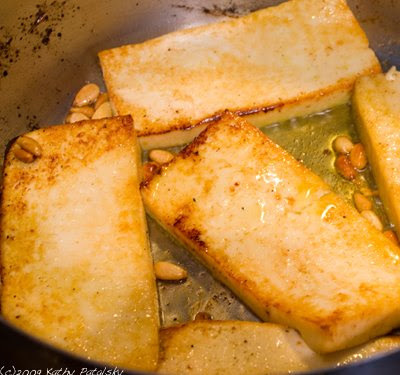 You want to brown the edges of the tofu, while still keeping the center of the tofu fluffy and moist. Salt and pepper the tofu as needed. About 1/2 teaspoon salt/pepper per batch. Repeat this process with all your tofu rectangles. I had about 10 to work with. Next, in the still hot pan, add a few drizzles of olive oil, dash of salt and the mushrooms and garlic cloves. I'll also add in some leftover lemon juice if the pan is bone dry. Saute for a few minutes, covered. Next add in the pine nuts. When the pine nuts toast up and turn dark in color remove the pan from the heat. Add some fresh black pepper and toss this mixture. 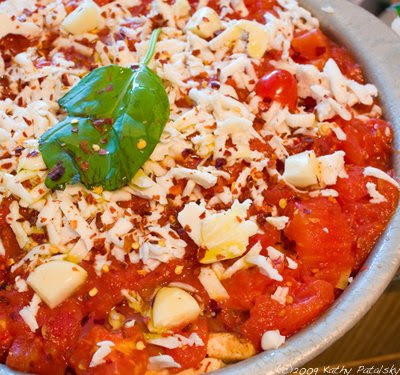 You can also toss in some red pepper flakes if you want a spicier lasagna. Set this mushroom mixture aside. Now back to the lasagna layering. 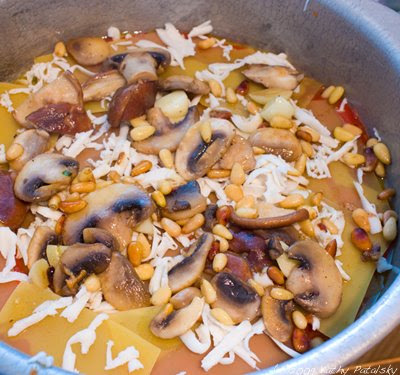 Atop the last layer of cheese, add the mushroom mix. Spread it evenly over the pasta. Next add another layer of pasta. Next add a thick layer of San Marzano tomatoes. Next, add a thick layer of tofu. Pack them in tightly. 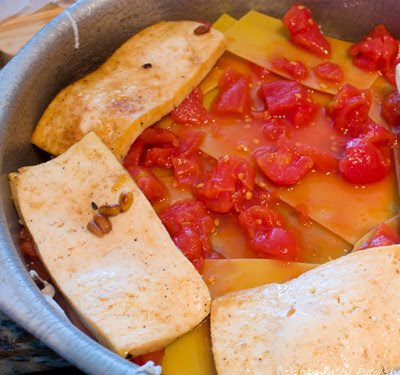 Next, pour a layer of tomato sauce atop the tofu. Next, add another layer of pasta strips. Next add another layer of cheese. And another layer of pasta. Next, a last layer of San Marzano tomatoes, and some pasta sauce as well. Then cover that top layer in a thick spread of shredded cheese. Sprinkle about a tablespoon of crushed red pepper flakes on top. *You can also drizzle a table spoon of olive oil on top for a tad richer finished product. 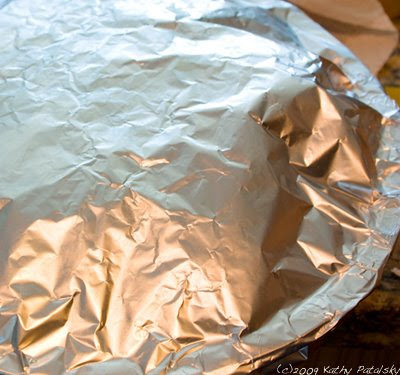 Cover the lasagna with foil-tightly. Place in a 350 degree oven to bake for 45 minutes. When the 45 minutes are up, carefully uncover the lasagna and broil it on high for about 5 minutes to brown the top cheese layer and crisp up the edges. Garnish with fresh basil, chopped parsley and more red papper flakes.